Knights of Creativity Spirit & Ale: Obama Takes Knights Lead! 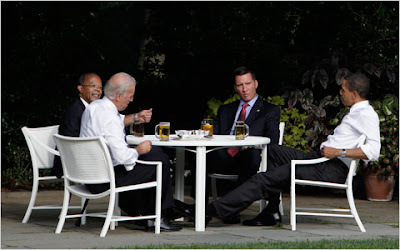 It seems that President Obama has taken the Knights lead and decided to start holding "Beer Summits" to solve the world's problems (see yesterday's post). Good for him. What better way to clear the air and have some thoughtful conversation (though I don't know how merry the White House Suds Summit was, it's a start). And if happy hour at the White House is what's needed to create solutions -- i.e. health care bill doodled out on a bar napkin -- then all power to the President. Yesterday, President Obama knocked back some cold beer in the Rose Garden with Harvard professor Henry Louis Gates Jr. and police Sgt. James Crowley of Cambridge, Mass., the two men at the heart last week of a heated debate over race in America. For some odd reason, Vice President Biden (a teatotaler) also joined them. "I have always believed that what brings us together is stronger than what pulls us apart," Obama said. "I am confident that has happened here tonight, and I am hopeful that all of us are able to draw this positive lesson from this episode." And what exactly did they talk about? I have no idea. Of course, what's really paramount is: What beer they chose to drink! So, this morning I put on my investigative Sherlock Holmes Deerslayer Hat and started making phone calls to high level officials (okay, I just googled it). On this great day in history, a waiter delivered mugs of beer -- along with peanuts and pretzels, of course -- to the men, who sat at a small table in the Rose Garden. Crowley sipped a Blue Moon, brewed by beer giant MillerCoors, an offshoot of two foreign companies. Gates drank a Boston beer, Sam Adams Light (from back home). Vice President Joe Biden, a surprise addition to the gathering, requested Buckler, a non-alcoholic beer (and a Dutch import, no less). President Obama wielded a Bud Light, straight out of St. Louis by way of a Belgian-run behemoth. (that choice, by the way, has upset many beer enthusiasts). I say: Don't judge the "Suds Summit" or the beer choices -- Unity Through Diversity! dear..lord it hot outside and i have just come in off the road...my mouth is as parched..as it can get..and this Blog is making me head off to the nearest Beer Garden... to get my gums round a cool ale. I have to admit that I was less than enthused by Obama's selection. 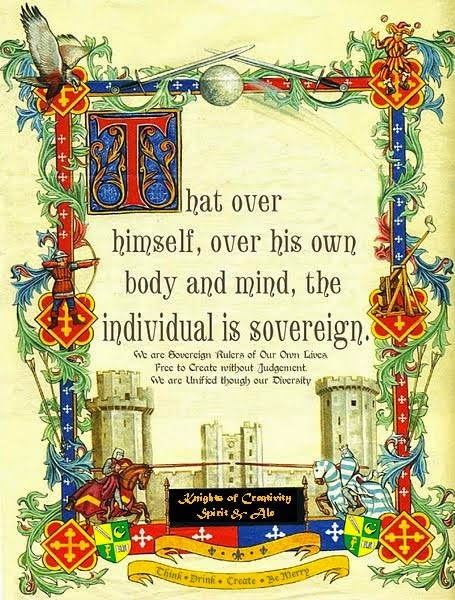 However, in the Spirit of Unity through Diversity....and also a reminder from Sir Bowie to not Judge our fellow Knights and Ladies who prefer light American (Belgium) Beer (Horse Piss), I will give him an A for Effort and showing the world how real human beings can discuss events while hoisting a mug of your favorite beverage. Biden obviously wanted the photo op. Funny how the two invities remain in their suit jackets. I would have followed the lead of the Pres and rolled up the sleeves, excused the press and drank the day away. I'm not above a Bud Light on a hot day. 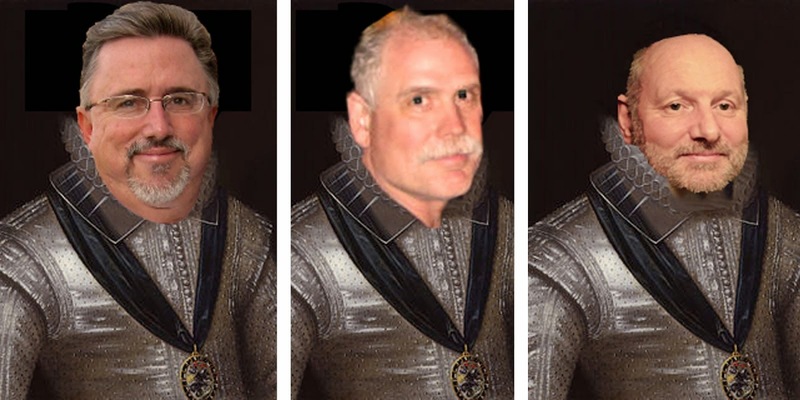 It may have been our noble leader's attempt at appearing like regular folk. When I think of all the barroom conversations where all of the worlds problems have been solved, I HAVE to think this is a great idea. Tom and I lifted a glass at 8:00 in solidarity. I hate to admit it, but it was Bud Light. Our pretzels weren't in fancy silver bowls, though.